Albert Einstein and his theory of relativity have been an inseparable pair for the longest time, so much so that the world knows of E=mc2 formula, although not too many will be able to explain it to you in detail. Having said that, scientists aren’t all that stuck up, you know. 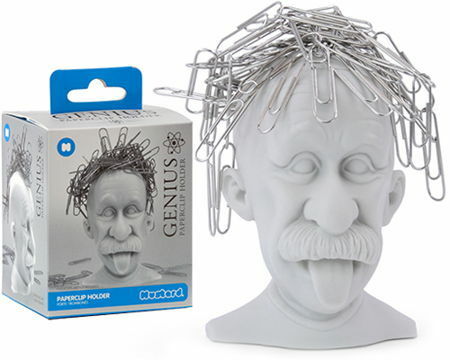 Here is his lookalike, and to make sure that you can help emulate Einstein’s disheveled look, he comes across as the $9.99 Genius Paperclip Holder. With this unique bust, you will be able to keep all of your paperclips safe as you recreate a gravity defying hairstyle. Of course, you would need to get your own paperclips – the more the merrier!